short girl, long island. 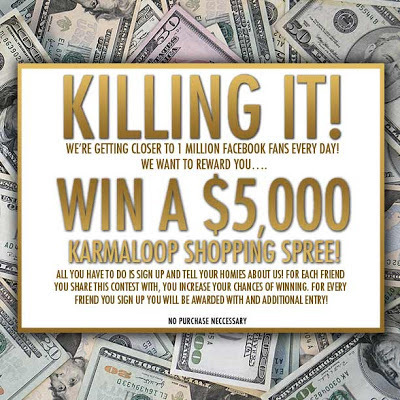 : Win a $5,000 Karmaloop Shopping Spree! I love Karmaloop. Over the years, I have ordered a ton of items from their store + am always satisfied. If something ever went awry [like the time they sent me a pair of orange shorts instead of shirt], they have gone above + beyond to fix it. Now, I know this is totally last minute to post, but I just realized this was going on in the last ten minutes or so + ends Tuesday, December 4. To celebrate passing the halfway mark to a million likes on Facebook, they are giving away a $5,000 shopping spree to one lucky winner. Nice, huh? What I really love about Karmaloop is that there is something for everyone here - they have an array of apparel, shoes, tech accessories + lots of other rad stuff, so anyone who wins is sure to find something that fits their style. If any of my readers end up winning, you have to come back + let me know, so I can tell all the readers about one of our own snagging the shopping spree. If you don't, no worries. They always have killer sales, plus if you use the rep code ShortGirlLongIsland you can save extra cash [yes, you can use a promo code + a rep code]. May i just got a bundle of tips about online shopping, you going awesome and i want you to go ever best..